This section offers a summary of recent enforcement activities at the federal and state level aimed at combating illegal immigration. It is based on government data rather than on the findings of the 2007 National Survey of Latinos. The Department of Homeland Security uses the term “removal” rather than “deportation” to describe the actions of its Immigration and Customs Enforcement (ICE) and Customs and Border Protection (CBP) divisions. 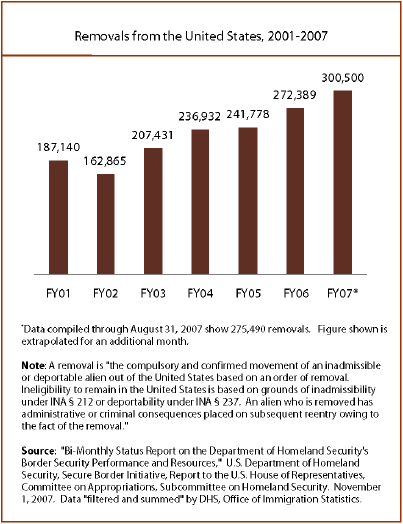 In fiscal year 2007, there were slightly more than 300,000 removals of illegal immigrants from the U.S., an 84% increase since 2002. About one-third occur at the Southwestern border, after an immigrant is apprehended trying to enter the country illegally. An increase in worksite raids around the country by ICE has led to a nearly ten-fold rise since 2002 in the number of undocumented immigrants arrested at their workplace—from about 500 in 2002 to about 5,000 in 2007. (The Pew Hispanic Center estimates that 7 million to 8 million undocumented immigrants are in the U.S. workforce). ICE has also announced a new policy that would punish employers who fail to verify their workers’ Social Security information. However, the implementation of this new policy has been delayed as a result of lawsuits filed by the American Civil Liberties Union and the U.S. Chamber of Commerce. 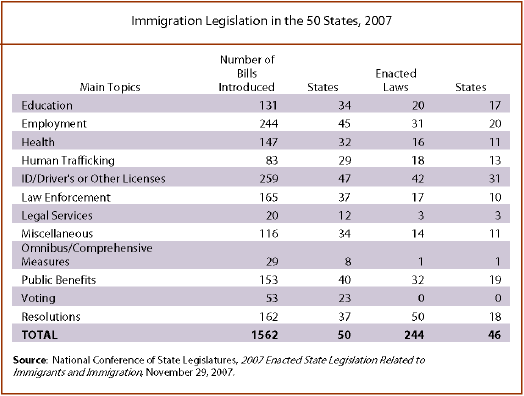 If implemented, the electronic verification system and “no-match” regulations could have a substantial impact on unauthorized migrants attempting to work in the U.S.
As of November 16, 2007, a total of 1,562 bills and resolutions related to immigrants and immigration had been introduced in the 50 state legislatures this year, and 244 had been enacted, according to the National Conference of State Legislatures. 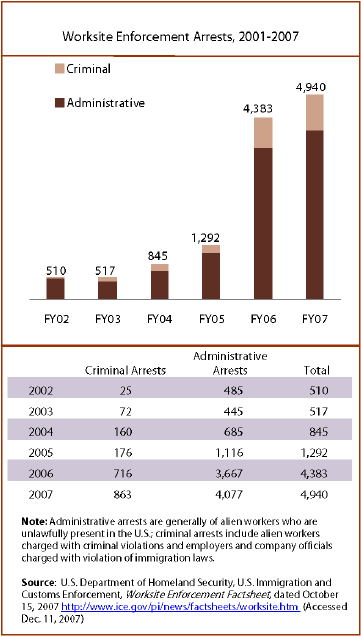 These figures are almost triple the number of immigration bills introduced and enacted in 2006. The measures cover a wide range of policy areas, including health, education, employment, law enforcement, legal services, drivers’ licenses and public benefits. Many (but not all) seek either to step up enforcement against, or deny benefits to, illegal immigrants. Ten states allow undocumented students to receive in-state tuition at public colleges. Seven states let illegal immigrants get driver’s licenses, down from nine in the summer of 2006. However, Oregon is expected to drop off the list in February. Maine and Michigan lawmakers are reconsidering their policies as well. And this fall, when New York Gov. Eliot Spitzer (D) tried to buc this national trend by proposing that illegal immigrants be allowed to receive driver’s licenses in his state, the proposal proved highly controversial–both in New York and on the presidential campaign trail. Spitzer eventually dropped the idea. Six states partner with federal immigration authorities to enforce immigration laws; four states (and most major cities) forbid the practice. Nine states require at least some companies (usually state contractors) to use a federal database to verify that their new hires are in the country legally; one state, Illinois, prohibits compaines from checking out new employees on the database. Six states have passed laws since 2005 to cut off certain public benefits for illegal immigrants; however, six other states permit undocumented children to receive taxpayer-subsidized health insurance. All 50 states have sent National Guard troops to the 1,954-mile border with Mexico since July 2006 to support the Border Patrol’s increased enforcement efforts there.